As lawyers – or in my case, aspiring lawyers – we are all too aware of the pressures and mental health risks we face. 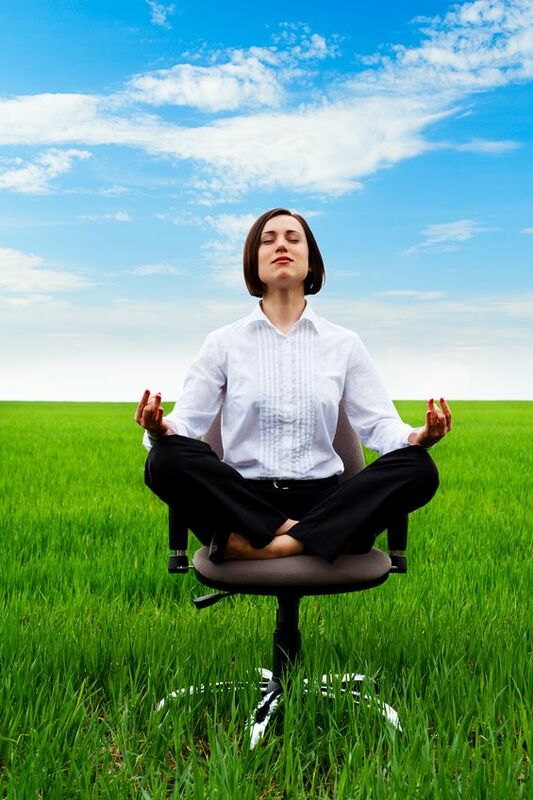 Ours is a stressful profession, and the need to be mindful of our wellbeing and proactive in maintaining a work/life balance is paramount. Each individual has their own approach to this challenge, and for the creatively inclined among us, it can be an even greater challenge. Music was one of the first casualties of my decision to study law. Throughout my childhood and undergraduate studies, I had discovered and nurtured a love of classical music performance – although I will readily admit I was not destined for the Melbourne Symphony Orchestra. I fell in love with orchestral music the first time I experienced the ecstasy of performance. There is a moment, not always attained, when the music works. When the orchestra becomes greater than the sum of its parts and explodes in perfect harmony. The feeling as a musician is indescribable. Your chest swells, the hairs stand up on the back of your neck and you achieve simultaneous clarity and euphoria. It is thrilling, addictive and so much more. The move across to law school and the loss of my music was a terrible wrench. Although I was shortly consumed by the demanding law curriculum, I was also half-heartedly googling community orchestras, wondering whether I could ever again find a place in my life for music. In between the mountains of assigned reading and the copious hours of study I felt obliged to put in every day, the law had established a monopoly on my time. It wasn’t making for a particularly joyful first semester. The light returned with the golden glint of a treble clef worn around the neck of a classmate. This kindred spirit told me about Lawchestra and gave me the nudge I needed to drag my viola back out of the cupboard. In Lawchestra, I have discovered many a like-minded lawyer-musician. Together we take time out from the pressures of work and study to meet and make glorious, uplifting music. Lawchestra are looking forward to our first performance of the year, Terminus which will be our greatest performance yet. Terminus brings together Lawchestra, Habeas Chorus (the choir of Melbourne’s legal industry) and Monash University Choral Society for two epic works, Mozart’s sublime Requiem and the Melbourne premiere of Australian composer Dan Walker’s Last Verses which is based on the final works of some of history’s greatest poets. The performance celebrates life and rallies against death, showcasing the final step of the journey. It promises to be a spectacular event. One cannot always pick when the moment of perfection will come. When everything clicks and the music begins to soar. It is transcendent, euphoric and amidst the majesty of St Paul’s, I cannot begin to imagine its power. Come and join us, for it shall be incomparable. 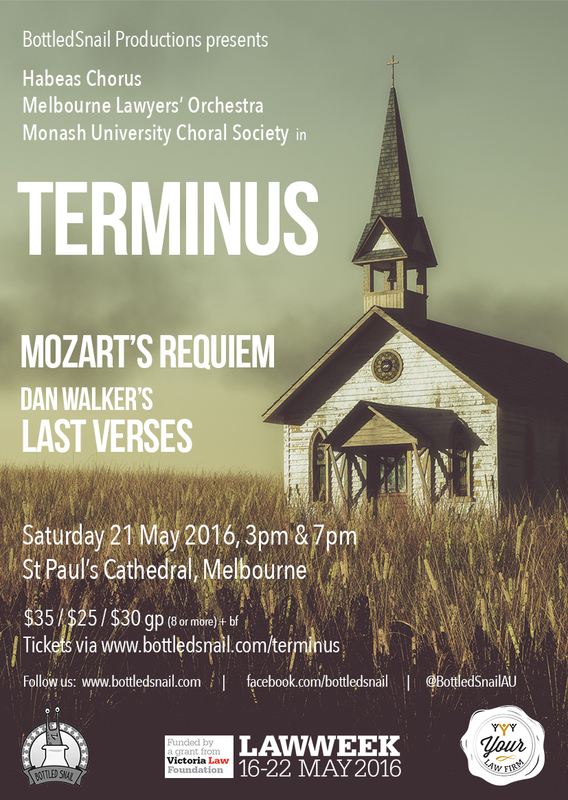 As part of Law Week, BottledSnail Productions presents Terminus at St Paul’s Cathedral on Saturday 21 May 2016 (3pm and 7pm) see http://www.bottledsnail.com/terminus for tickets and more information. BottledSnail Productions is an organisation that seeks to promote mental wellbeing in Melbourne’s legal industry through supporting and producing creative and performing art projects. It has staged musicals, comedy shows, theatre productions and runs many musical ensembles throughout the year. Terminus is supported by a Law Week grant from Victoria Law Foundation and sponsored by Your Law Firm. Katharine Kilroy is a third year Juris Doctor student at the University of Melbourne and plays viola in the Melbourne Lawyer’s Orchestra. It was four am when I realised I hated my job. Four am when I first seriously considered that maybe I didn’t want to be a lawyer anymore. I was sitting alone at my desk, marooned in the darkened silence of the vast open office waiting for my Partner to give me new instructions or (I hoped) let me go. Limbo in the twilight zone of the witching hour. You develop a strange mindset in Big Law. If someone had told me even eighteen months prior that I’d be sitting around in the early hours of the morning waiting for someone to tell me I could go home at 4am I would have laughed. Would have told them not to be silly, that as soon as the work was done I would’ve been outta there like a shot (if not before, let’s be honest). I had been a firm adherent to the eight-hour day. And yet there I was, resting my head on that evening’s stack of discarded drafts, unheeding of the red ink transferring to my cheek in bloody caress. Staring at the closed glass door, willing it to open. My Partner had been closeted away for what seemed like an eternity. Important client. Billion-dollar deal. Something about the tax treatment. It always came down to the tax treatment. I could see him through the clear but impenetrable barrier, furrowed brow furrowing further over an over-long nose, the fluttering of my eyelids rendering the whole face demonically distorted. And it was here, eyelids drifting, body slumped, that I realised I hated my job. I hated that it kept me bone tired and tied to office furniture at all hours. I hated that I had become familiar with stress sleeping (an involuntary cousin to the cat nap, it is hallmarked by the sudden jolt of consciousness when your body’s exhaustion no longer outweighs the constant heavy fear of being found kipping on the job). I hated that I had stopped making plans for weeknights so that I wouldn’t have to cancel last minute due to the euphemistic ‘work’. I hated that I was so tired and overemotional that I regularly cried in the disabled bathroom (in an open plan office, these quickly become the unintended havens of privacy). But most of all, I hated that my Partner was still there too. Having hit his hallmarked time for a mid-life crisis earlier that year, he had given nearly thirty of his waking years to the firm. And there he was, sitting head slumped in hands at four am while overseas clients in time zones more conducive to comprehension and consciousness berated him for the minor errors that sneak between the pages when you don’t have the attention to keep them out. I hated that he would talk incessantly about the importance of family, of his love for his three young children, and yet, if he made it home for dinner one night out of five it was in positive aberration. I hated the realisation that he, like me, was still working for the weekend. Because surely, surely, thirty years should have changed that? Surely, surely, that was why we will bought in? The premise that you worked hard (too hard, ludicrously hard) on the promise that there would be a time you wouldn’t. That there would be a time where you would have clients who trusted and respected you and you would have others (underlings, minions, serfs) to support you in providing duly timed services to those clients while you saw the family you delayed for a decade. For this was the Promised Land of Partnership. I don’t know when it changed or if it ever was. But I know many of the parched lips hungrily drinking from the poisoned well, unaware that salvation is saline. For in a world of stagnant demand but thriving competition there is no point on which laurels can be rested. Not even for a moment. Not even at four am. And so you keep working for the weekend. 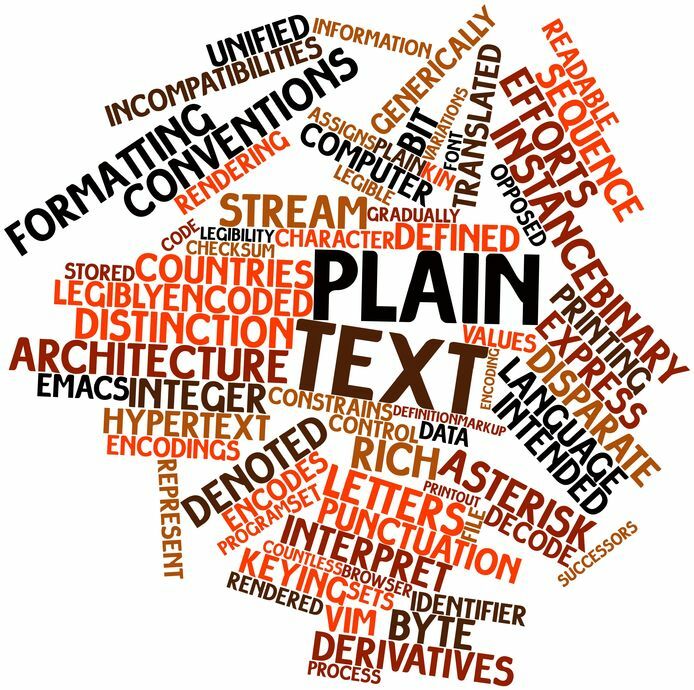 And that realisation, that my fifty-year old Partner was still in the same boat as I (albeit with flashier brass fittings and leather seats), was the semi-conscious realisation that broke my already wavering belief in Big Law. Because followed quickly on its heels was the realisation that if the job never changes, never becomes less demanding, less needy, then something’s gotta give right? And that something is you. It is your weeknights. Your weekends. Your expectations of boundaries. Your ability to say no. Your perception of what working hard is. By the time I left I didn’t think I was working hard. I knew I was working more than I wanted to, but I did think that was because I was selfish and lazy. It seemed normal to have less than six hours between when you finished and when you came back. It seemed luxurious to have eight. It seemed weak to complain. And these were the thoughts I had in the dark wasteland of empty desks. And it was after five am when I left. And it was just after nine am that I came back. And I didn’t think about the thoughts I’d had for another month. I was beginning to think being anything more than an appreciator of music wasn’t going to fit in with sensible, mortgage paying grown up life; that involvement in the performing arts was a childhood luxury that I once knew. I have Habeas Chorus to thank for helping me to keep music in my life and contributing to an ever important work-life balance. Having chosen Law as a career path, I have spent the last four years caught up in textbooks, exams, volunteer experience, paid experience, more exams, networking, attending essential skill-building seminars, clerkships (or lack thereof) and then finally landing my first lawyer job. My ability to work a chromatic scale has well and truly transformed into touch-typing proficiency, and my memory of key signatures has become a repertoire of a growing legal vocabulary. As a first-year lawyer in a busy and growing immigration law firm, work quickly became the absolute priority in my daily life. I’ve tried to work hard, within a culture of equally hardworking and inspiring young lawyers, to learn and earn my way into the profession. However, with the adjustment to often demanding hours and so much to take in, despite the warnings I found myself starting to cut out ‘luxuries’, including exercising, seeing friends, cooking, healthy eating, as well as playing music. 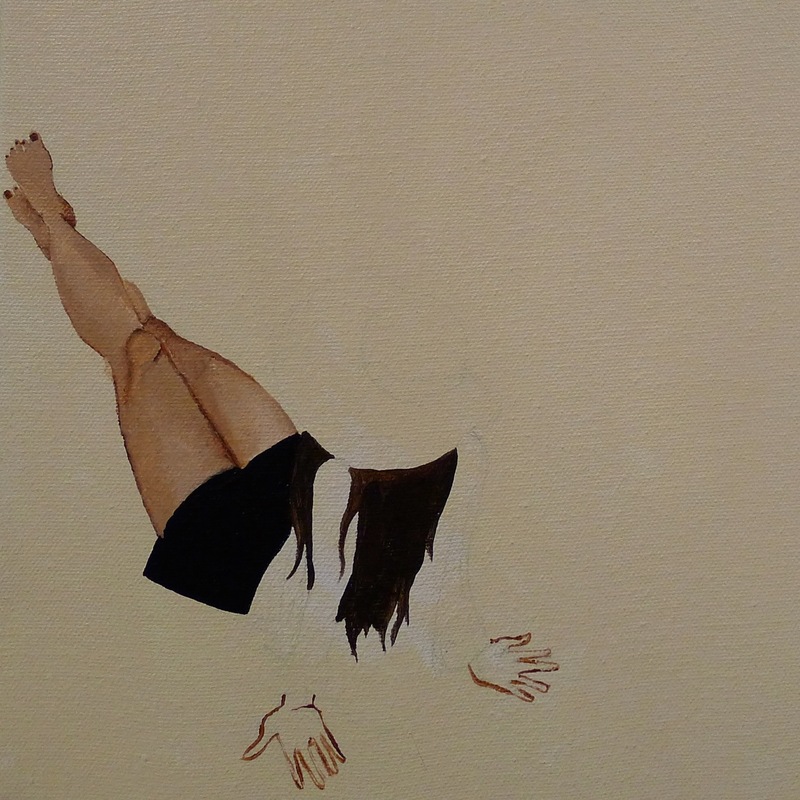 As a result I started feeling tense and a little bit hollow. In a dark cold month of winter 2015 I tentatively joined an inspired, diverse bunch of dedicated and similarly flat-out law professionals for Monday night rehearsals with BottledSnail Production’s newly formed choir, Habeas Chorus. Throughout Habeas Chorus’ inaugural and subsequent term, a solid turnout of at least 20 of us have arrived at rehearsals to the welcome of a cheery coordinator, Emilia, and a bewilderingly energised conductor, Dan, whose enthusiasm for music and teaching is contagious. Very soon we are in the swing of belting out tunes in surprisingly beautiful harmony. Although for many of us sight reading is a little rusty, Dan makes it seem easy to re-learn. Currently we’re tackling a nostalgic bunch of classic pieces from films including The Blues Brothers, Moulin Rouge and The Lion King; a stark but enjoyable contrast to last term’s classical repertoire. It only took the first rehearsal to remember the uplifting feeling of being warmed from the inside out, not only by my own hit and miss vocals, but the various voices of 20 or 30 others, rising and falling around me. Despite the everlasting winter and the ever present challenge of Monday-itis, whatever sort of day I’ve had I always relish rehearsals and end up singing all the way home. I wonder if there’s anyone else out there who thinks like me and wants to bring music back into their lives? I would recommend it to anyone, come along to Habeas Chorus and remember why music is good for the soul! Julia Larner is a lawyer at Carina Ford Immigration Lawyers. 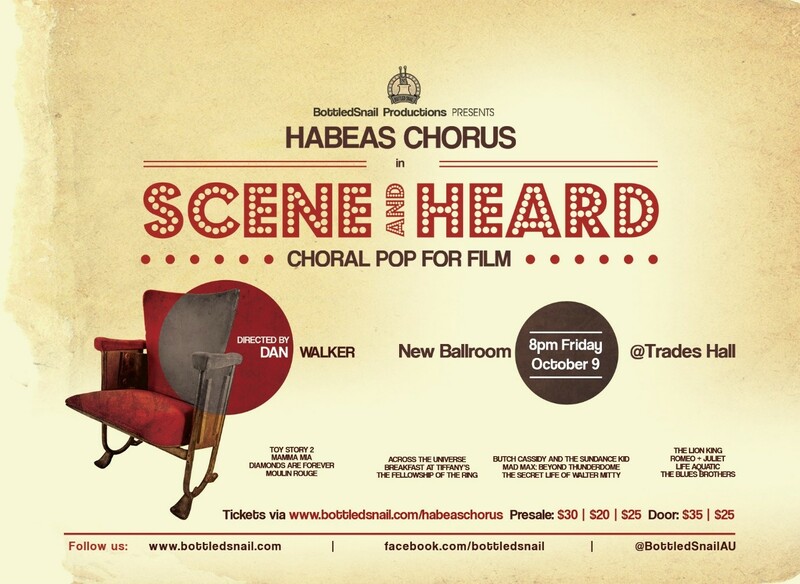 BottledSnail Productions presents Habeas Chorus in Scene and Heard: Choral Pop for Film starting at 8:00pm on Friday 9 October at the New Ballroom at Trades Hall. Tickets are on sale now at http://www.bottledsnail.com/habeaschorus. If you’d like to join Habeas Chorus please go to http://www.bottledsnail.com/habeaschorus to register your interest. It was not until my recent opportunity to shadow a barrister during two Conciliation Conferences that I truly appreciated the gem we know as Appropriate Dispute Resolution (‘ADR’). Certainly, we read and hear about the benefits of ADR including a timely, cost effective resolution, party control and informal setting. It is not until you actually witness such outcomes first hand, however, that you may truly appreciate the effectiveness of ADR. In particular, for me it resembles a resolution process at the heart of justice, achieving positive outcomes ‘for the parties’ as opposed to a battle of tyranny that often results in court proceedings. There are two key elements that stood out during my observations of ADR including: the differing approaches of a conciliator and the effect this has on the outcome of ADR, and party control. Firstly, the two conciliators I observed took very different approaches in running the conferences. It was particularly interesting to note these approaches and the effect they had on the smooth running of the meeting and promoting a final outcome. The first conciliator was authoritative yet understanding. Structured yet fair. She ran the conference initially by making the parties feel welcome and important. This was achieved by asking them simple questions such as whether they would need to move their cars due to city parking restrictions and reinforcing that they were able to ask for a break at any point. She followed this opening by listing key issues on the white board and asking for parties’ input, then allowing the conversation to flow between parties, evenly balanced centered on those issues of importance. Strengths were constantly re-visited so that parties can see their positive progress and aim for more movement towards resolution. The mediator would also utilise a calming technique by lowering her tone and slowing down the tempo of her speech when parties appeared reserved. This instantly calmed them down and allowed them to re-consider the other side’s requests. The result was a timely resolution that benefited both parties. 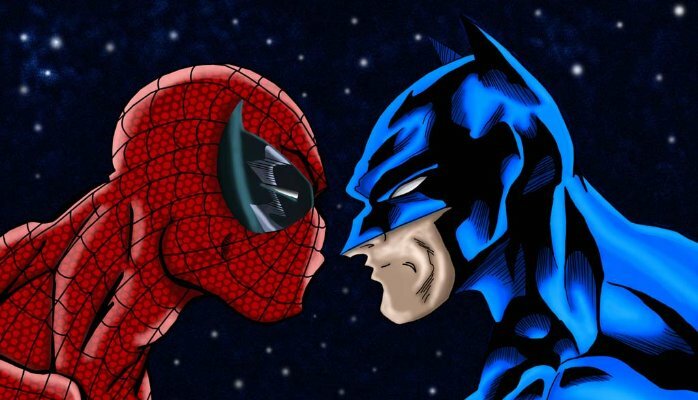 The balance that this outcome struck was incredible with both parties finally clarifying their concerns and actually sacrificing for the other party in a balanced and beautiful resolution that suited both parties and preserved their relationship in such a way that any future issues could be dealt with amicably. In contrast, the second conciliator was more reserved and allowed parties to structure the process. This generated a very different outcome. On the one hand, parties felt they had complete control over the process and outcome, which was a benefit to them. However, allowing parties such control did make the process of resolution slightly longer. The benefits of this approach include allowing parties to put forward their interests and to test their relationship. It is certainly a method of testing whether parties can preserve a relationship into the future. After some discussion and extended negotiations, there was again a positive resolution that suited the interests of both parties and allowed ongoing revision of the agreement so as to tailor it over time. Once again, elements such as party control and fair resolutions highlight the numerous benefits of ADR. On another note, the nurturing and guidance that ADR offers parties also makes this process fundamental. Such nurturing goes beyond the chance for parties to have a voice in the process. In particular, the first Conciliation Conference I attended included a party who spoke English as a second language. 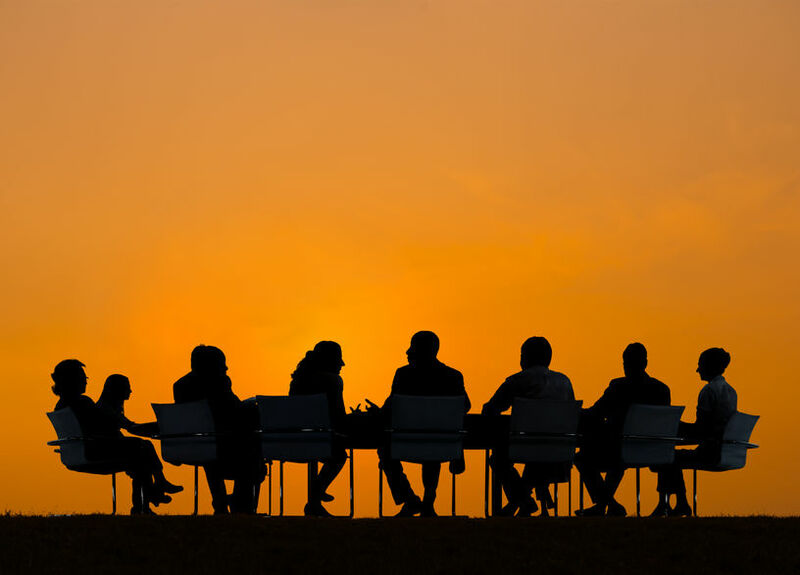 This was not a barrier to the process, nevertheless, the conciliator was more than accommodating, allowing this party a person of support and time to process the options and consider what decisions to make. Such support highlights nurturing and compassion, values that often escape daily court proceedings that can be brought to life in the ADR field. Balance, party control, fair outcomes and compassion are just some of the advantages provided by ADR. 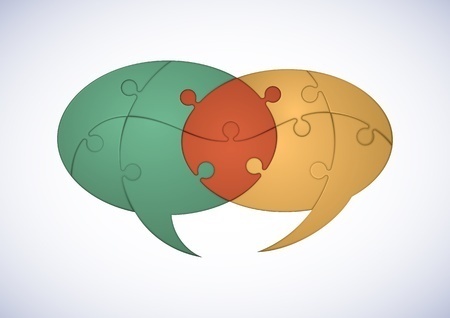 ADR allows parties to devise their own creative solutions and in turn increases collaboration, facilitation and long-term agreements that can be sustained. Importantly, solutions can tailor parties’ individual needs and benefit not only parties to the proceeding, but carry extended benefits to all parties affected by the outcome including family and friends. 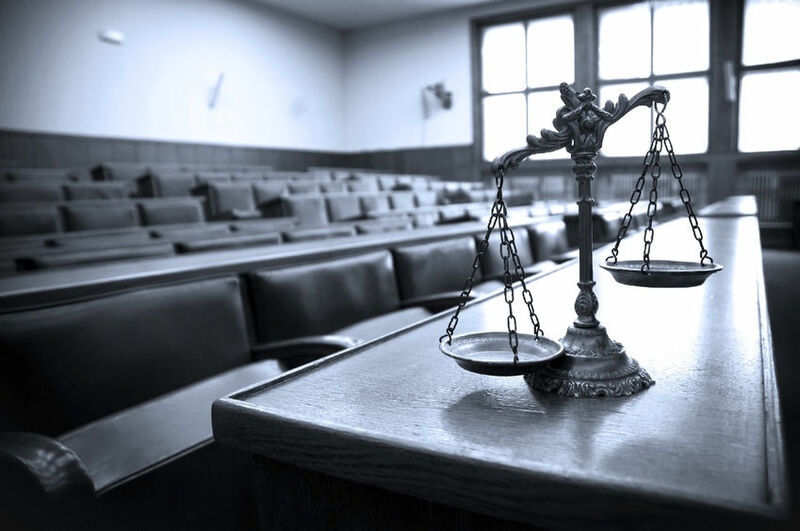 Witnessing ADR first hand certainly highlights the importance it plays in balancing the scales of justice. Currently, it is implemented in family court matters, civil matters, workers compensation cases and more. Interestingly, over 60% of practitioners agree over 90% of cases are settled via ADR with its popularity increasingly growing into the future.